Sports, dancing and silly active games are nourishing childhood experiences. AllPlay helps to make sure kids of all abilities have the chance to play. In Australia, participation in organised sport and dance is an important and typical part of childhood. We see our kids decked out in their favourite sport gear, getting fit and strong, cheering on teammates and laughing with friends. For the one in five Australian children with a disability, however, this may not happen. Studies show that children with a disability or developmental delay which impact on their social, communication, motor and thinking skills, participate far less in organised sport compared to other children. The reasons are varied and include a lack of programs sensitive to the unique needs of each child, low expectations of what children with disabilities can achieve, through to children who use wheelchairs not being able to access to buildings where programs are run. How can we make physical activity and games more inclusive for all children? The problem for many teachers and parents is not knowing the best ways to create these opportunities. AllPlay, a flagship program of the Deakin Child Study Centre at Deakin University, aims to help bridge this gap. The digital platform provides resources and education for teachers, coaches and parents to help increase opportunities for children with disabilities to engage in physical activity. AllPlay founder Professor Nicole Rinehart says she started the program as a way to level the playing field when it came to kids’ sport, so children of all abilities can feel welcome and included. AllPlay’s digital resources are based on the latest up-to-date research and information on the best ways to support and include children with a disability so they can thrive. It also includes information for health professionals such as general practitioners, paediatricians, psychologists, speech pathologists and occupational therapists, so they are also aware of the benefits for families and can help break down the barriers to inclusion. 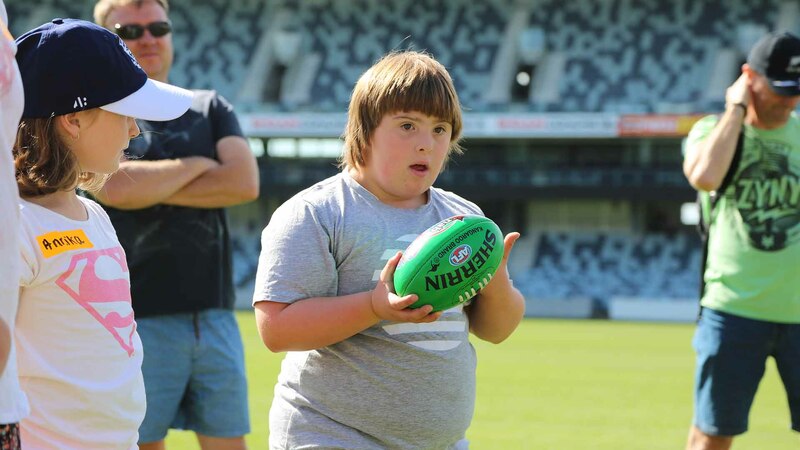 The program is quickly becoming a world-leading resource, building alliances across Australia and around the globe with those keen to learn from the AllPlay model to make inclusion a reality. It has found like-minded partners in the Australian Football League (AFL) and Moose Toys, whose focus is making children happy children and enabling equal opportunities for all. Why get kids playing sports? Here are just a few reasons it’s important for all children to have the opportunity to get active. Being physically active helps improve a child’s strength and bone health, as well as reducing their body fat. This isn’t only good for now but also in later life, as it helps reduce the risk of developing serious diseases later such as osteoporosis, cardiovascular disease, type 2 diabetes and certain types of cancers. More and more studies show there is a positive relationship between how active a child is and their performance at school. Children who are physically more active have been found to achieve better academic results. Physical activity has also been linked to improved concentration and memory. Whether it’s scoring a goal for the team or being able to catch a ball, achievements – big or small – can boost a child’s self-esteem. Children learn to persevere when things get tough. They can develop a more positive self-image and a brighter outlook of the future. It also helps a child feel valued and an important part of the community. One of the greatest benefits of sports for all children is the opportunity to help them develop their social and communication skills. What better place to learn how to win and lose than on the sports field, where emotions run high in a supportive and safe environment? Children learn important life skills such as how to bounce back from failure, how to work with others, and how to make friends and keep friendships going. Visit AllPlay to find out more about how to make your community more inclusive. Dr Tamara May is a senior research fellow at Deakin University's School of Psychology.